Last week, Source One’s very own Diego de La Garza joined the United States-Mexico Chamber of Commerce in welcoming the Governor-Elect of the State of Querétaro in Mexico: Francisco Dominguez Servien. Located just outside of Mexico City, the state of Querétaro is an economic regional power and manufacturing base for a number of industries including aerospace and automotive. As such, the state is a major driving force of the country’s growth and offers many competitive advantages for companies interested in expanding or looking to establish operations in Mexico. 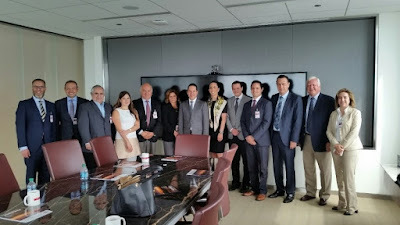 During the exclusive meeting, attendees including Mexico’s Secretary of Tourism, leaders from top universities in Chicago, and ProMexico (the Trade & Investment arm of Mexico’s Ministry of Economy), discussed with Dominquez the state of Querétaro’s economy and the Governor Elect’s plan for providing incentives for companies looking to make supply chain investments in the state. De La Garza, Source’s One Senior Project Manager and Latin America Sourcing expert, was one of only two consultants present in the meeting to share his perspective on doing business with suppliers in Mexico. Dominguez shared his plans to simplify the process for working with Mexican suppliers, including providing tax incentives and streamlining the administrative burden on companies by eliminating unnecessary or bureaucratic processes to make it easier to for investors to establish operations in Mexico. In addition, the Governor Elect explained that education and connectivity are key, along with his plans to open new and improved transit routes between key manufacturing states in North America as a fundamental opportunity for business owners to better connect with the state. As a major driver of the economy, cultural tourism was also a point of discussion, emphasizing the need for potential investors to understand the state offers a safe and culturally sustainable environment to do business. Academic representatives in the meeting also discussed the development of intensive immersion programs for students and professionals to overcome cultural differences and develop skills necessary to facilitate successful negotiations and long term partnerships. Those following the news and the global economy understand that moving manufacturing and supply chain operations to Mexico is a growing trend for North American companies; one that is proven to have a number advantages over the alternatives such as China, and Southeast Asia. However, sourcing suppliers in Mexico and Latin America present unique challenges, some due to a lack of supplier databases and others derived from cultural differences primarily in how manufacturers advertise their capabilities. As a result, many companies looking to establish a supply base in Mexico lack the time and expertise to identify and onboard a supplier effectively. Source One’s nearshoring services simplify the supplier identification and negotiation process. With nearshoring experts, years of experience, and connections in these geographies, Source One makes it easy to establish supply chains in this growing area.